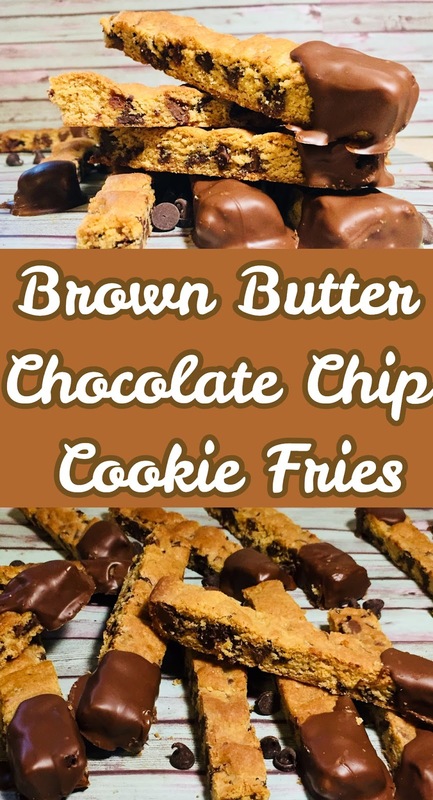 A sweet and salty chocolate chip cookie with bittersweet chocolate, milk chocolate and nutty brown butter, giving you a caramelized sugar flavor, in a cookie fries form and dipped in chocolate. These cookies are not your normal cookies. First, using brown butter instead of softened butter give the cookie a different flavor. They're are notes of butterscotch or a caramelized sugar. Another thing that makes these cookies different is that they are cut into 'fries'. I have seen this trend going around Pinterest lately with a sugar cookie recipe. I love me a good chocolate chip cookie, like I have said in different post, but I am always trying to find a way to make it tasty even better. Since National Chocolate Chip Cookie Day, May 15, is around the corner I had to this post. 1. In a medium saucepan, cook butter on medium low heat until foamy and lightly brown, 10 to 12 minutes, close to color of a light caramel color. Stir often. Remove from heat and transfer to a large bowl. Let if cool for 10 minutes. 2. While the butter cools, whisk together flour, baking soda and fine sea salt. Set aside. 3. Once the butter is cooled, add brown sugar and granulated sugar and mix until well incorporated Add eggs one at a time and vanilla extract until it lightens up and thickens about 1 to 2 minutes. Slowly add in 3/4 of the flour a cup at a time. Save the last 1/4 of the flour. 4. Toss chocolate chips in the last 1/4 of flour and fold into the batter. The batter maybe a little loose, that's okay. Cover bowl and chill for 30 minutes. 5. Cover a 11 x 17 pan with parchment paper. Press cookie dough into pan and chill in the fridge for 2 to 3 hours or until firm. 6. Preheat oven to 350 degrees, bake in the pan for 20 to 25 minutes or until middle is cooked through. Removed from the oven and let cool in the pan for 10 minutes, remove from pan and cool on a cookie sheet for another 10 to 15 minutes. 7. Once the cookies are cooled, cut into 'fries' about 1/2 inch to 1 inch by 4 to 5 inches with a pizza cutter or a knife. They maybe a little soft but they will crisp up once they have cooled fully. 8. Chocolate Drizzle: Melt chocolate, sea salt and coconut oil in microwave for 1 to 2 minutes, stirring every 30 seconds until fully melted. Let it cool for 2 to 3 minutes. 9. Dip cooled 'fries' into chocolate and let set for 20 to 30 minutes in the fridge. Store in cool place or in the fridge. Wow! Those look AMAZING. Going on my "to make" list. Sweet and salty and then chocolatey this sounds like a perfect treat! I wish I could try it now so hungry! You had me at cookie. Then you said fries and I was even more excited. This is amazing ! These look yummilicious. I might have to put off my diet plan to have them. These look amazing! Can't wait to make them with my girls, they will love them! Ooh I could so eat these right now, they look delicious. The recipe looks quite simple and quick to follow too, definitely one to try. This look delicious and so tasty. I am free this weekend and I must give this a try! There is so much amazing about these cookies. Mmmm... and a hint of butterscotch. Too perfect. I hadn't see the cookie fry trend before! This looks like it would be the perfect snack to pair with a cappuccino! These caramel chocolate chip cookies look delicious. It sounds like they're unique too. What a fun alternative to your usual chocolate chip cookies! I definitely want to try using brown butter - it sounds delicious! And the fry idea is so cool too! This is so tempting. The recipe you shared is also easy. Maybe, I will try this at home this weekend! I like how the cookies is cut into finger or "fries" shape, that way it is easier to eat I find. This look different from the ordinary cookies and sure attracts more likes from my family. Those browned butter chocolate chip cookies look amazing! I can taste that dipped chocolate from here. These would be great for guests or coffee hour. They even look more impressive than regular cookies. Man oh man. I knew from the title I was gonna finish this post feeling compelled to try this recipe out and I was right! Literally my two fav things in the world ( chocolate and cookies) so I have no choice but to make it happen! Thanks for sharing! These look delicous! I would love to dip these into warm melted chocolate! oh goodness this looks super yummy! I am craving for a big bite now. These look so yummy! I love the idea of cookie "fry" form, and then dipped in chocolate? Brilliant! These cookies look really yummy and I love sweet'n'salty! Didn't know there was a chocolate chip cookie day - guess there is a day for everything!? These cookies look rich and gooey and delicious. I would like to try them out through the screen! the recipe looks simple and the photos are yummy. These looks heavenly. Would love to try this recipe for my kids' birthday! These look amazing! I am defintely going to try these out for a summer treat this year! Thanks for sharing! This looks so tasty and the way you have clicked the pictures, it's really hard to resist it. I will try to make them for sure. These look incredible!!!!!! I love the fry size! Pinned to try asap! These look perfect for little hands or parties!! I would use almond or coconut flour to make Gluten Free for me. Yummy. Corr these would make a great Friday night treat right now! My daughter loves cookies. For this reason I try to make different types cookies at home for her. Your recipe look yummy and tasty. And it also easy recipe. i wanna try it. Thanks for sharing this recipe.